WHAT IS ALL-STAR COMPETITIVE CHEERLEADING? 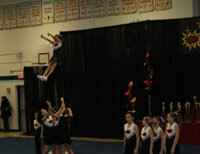 All-Star Competitive Cheerleading is one of the fastest growing sports in Canada. Our teams do not cheer for a specific school or sports team. Instead, our athletes work towards perfecting a 2&frac12; minute routine, which includes stunting, tumbling, jumping and dancing. Competitive cheerleading is a great way to improve your strength, flexibility, endurance and co-ordination. We rely on each member of the team to be successful, making this sport the ultimate team sport. Our team follows the United States All-Star Federation (USASF) rules for cheerleading. Our coaches are credentialed through USASF to the appropriate level of our team(s). A positive attitude, a willingness to learn & try new things, and the ability to focus are all necessary. We practice twice a week (Monday & Wednesday evenings) at a local elementary school, from September through April. Practices are mandatory.